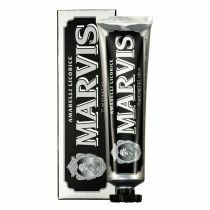 A fashion forward fusion of flavor, Marvis Jasmin Mint Toothpaste offers a sweet touch of mint with the surprising floral charm of jasmin. 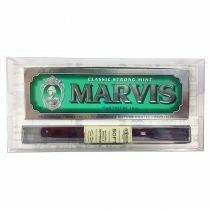 Marvis Jasmin Mint toothpaste is a harmonious, fashion-forward fusion of flavor that whitens and protects teeth, and freshens breath. 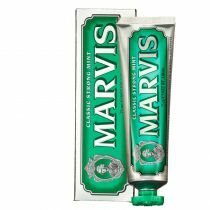 And like all Marvis toothpaste flavors, Marvis Jasmin Mint comes in a distinctive, display-worthy tube that makes the perfect bathroom accessory. I have to be honest, I hated the flavor. I see what they were going for, but to me it tastes like a mixture of bad grape candy and medicine. Do yourself a favor and stick to their mint flavors. Imagine lounging upon a chaise lounge on the mountain of the gods in a lush garden having your pearly whites scrubbed by singing cherubs. That's how amazing this product is. Best damn toothpaste ever made.' Nuff said.